Friedrich II. (the Great), King of Prussia, aged 68, by Anton Graf. Frederick II of Prussia, also known as Frederick the Great (January 24, 1712 – August 17, 1786) was a king of Prussia from the Hohenzollern dynasty, reigning from 1740 to 1786. He was one of the "enlightened monarchs" (also referred to as "enlightened despots"). Because of his accomplishments he became known as Frederick the Great (Friedrich der Große). He was also nicknamed der alte Fritz ("Old Fritz"). 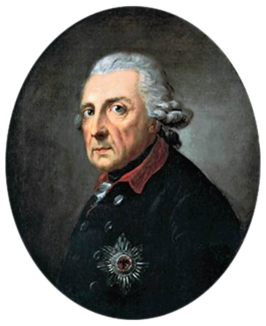 During his reign, Prussia, whose territories he expanded, became the foremost military power in Europe. He also laid the foundation for the eventual unification of the German princely states, which would enable Germany to emerge as a major world power at the start of the twentieth century. Frederick's bureaucratic reforms made the Prussian civil service more efficient, methodical and hard working and also conscious of its public duty. He also introduced a system of primary education, and codified the law. This would become the basis of the future German state, and Prussian identity, which valued military prowess, owed a lot to Frederick's own military successes. This later became linked with the German sense of superiority and of imperial destiny that contributed significantly to the causes of the two world wars. Historically, the French had tried to keep Germany weak and divided. Frederick placed Prussia firmly on the military map. Prussia has been described as not so much a country with an army, but an army with a country. Territorial expansion often follows when a country is militarized, and sees war as a patriotic duty. Frederick was born in Berlin, the son of Sophia Dorothea of Hanover and King Frederick William I of Germany. The so-called "Soldier-King," Frederick William had created a formidable army and efficient civil service, but is otherwise recorded in a negative light. Frederick William was known to strike men in the face with his cane and kick women in the street, justifying his outbursts as religious righteousness. In contrast, Sophia was well-mannered and well-educated. Her grandfather, George, Prince-Elector of Hanover, was the heir of Queen Anne of Great Britain. George succeeded as King George I of Great Britain in 1714. At the time of Frederick's birth, the Houses of Brandenburg and House of Hanover were enjoying great prosperity; the birth of Frederick was welcomed by his grandfather with more than usual pleasure, as two of his grandsons had already died at an early age. Frederick William wished his sons and daughters to be educated not as royalty, but as simple folk. A Frenchwoman, Madame de Montbail, who later became Madame de Rocoulle, had educated him and he wished that she should educate his children. Frederick was brought up by Huguenot (French Protestant) governesses and tutors and learned French and German simultaneously. As crown prince, Frederick displayed passionate interests in French literature, poetry, philosophy, and Italian music. This roused the suspicions of his father, who wanted to see his son follow more "masculine" pursuits like hunting and riding. He called his son "an effeminate chap," and subjected him to bloody and humiliating beatings. Frederick found an ally in his sister, Wilhelmine of Bayreuth, with whom he remained close for life. At age 16, Frederick also formed an attachment to the king's 17-year old page, Peter Christopher Keith. Wilhelmine recorded that the two "soon became inseparable. Keith was intelligent, but without education. He served my brother from feelings of real devotion, and kept him informed of all the king's actions... "Though I had noticed that he was on more familiar terms with this page than was proper in his position, I did not know how intimate the friendship was." Frederick William exiled the page soon after and assigned a young soldier, Lieutenant Borcke, to be Frederick's friend. Frederick became enamored of the lieutenant, writing, "My wearisome affection breaks from me and discloses to you the feelings of a heart filled with you, and which cannot be satisfied save in knowing that you are fully convinced of the tender friendship with which it adores you." There is no record of the lieutenant returning the interest. Interest was returned the same year, however, by Hans Hermann von Katte, the 22-year old son of a general, and also a lover of French literature and music. When he was 18, Frederick plotted to flee to England with Katte and other junior army officers. His escape was botched, however, and Frederick and Katte were arrested. An accusation of treason was leveled against both the prince and Katte since they were officers in the Prussian army and had tried to flee from Prussia, allegedly even having hatched a plan to ally with Great Britain against Frederick William. 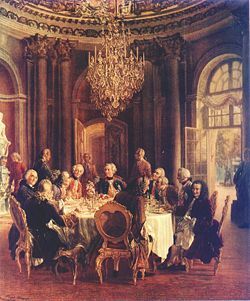 Voltaire in the court of Frederick II of Prussia. Voltaire is depicted to the left. 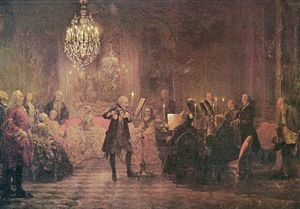 Painting by Adolph von Menzel, 1750. The prince was threatened with the death penalty, and the king did not rule out his being executed. In the end, Frederick was forced to watch the execution of his friend Katte at Kostrzyn nad Odr_, who was beheaded on November 6, 1730. When his companion appeared in the courtyard, Frederick called out from his cell, "My dear Katte, a thousand apologies," to which Katte replied, "My prince, there is nothing to apologize for." Frederick fainted before the sword fell. The king imprisoned Frederick for a year, during which Frederick began two of his longest relationships, with Lieutenant Count von Keyersling and Michael Gabriel Fredersdorf. Voltaire wrote of Fredersdorf, "This soldier, young, handsome, well made, and who played the flute, served to entertain the prisoner in more than one fashion." Fredersdorf was the heir of a peasant, but as king, Frederick would name him royal valet, then director of the royal theater, and eventually chancellor of the kingdom. The only way that Frederick regained his title of crown prince, however, was by marriage to Elisabeth Christine von Braunschweig-Bevern, a consort chosen by the king, on June 12, 1733. Frederick wrote to his sister that, "There can be neither love nor friendship between us." He considered suicide. After becoming king, Frederick largely ignored his wife, but she remained devoted to him nonetheless and never became pregnant. After the crisis in the relationship with the King in the early 1730s, father and son made a chilly peace later in the decade. Frederick William gave his son the chateau Rheinsberg north of Berlin. In Rheinsberg, Frederick assembled a small number of musicians, actors and other artists. He spent his time reading, watching dramatic plays, making and listening to music, and regarded this time as one of the happiest of his life. The works of Niccolò Machiavelli, such as The Prince, were considered a guideline for the behavior of a king in Frederick's age. In 1739 Frederick finished his Anti-Machiavel—an idealistic writing in which he opposes Machiavelli. It was published anonymously in 1740 but apparently disseminated by Voltaire to great popularity. Frederick's years dedicated to the arts instead of politics ended upon the death of Frederick William and his inheritance of the Kingdom of Prussia. Frederick the Great was an eighteenth century king of Prussia also nicknamed "der alte Fritz" ("Old Fritz"). Before his accession, Frederick was told by D'Alembert, "The philosophers and the men of letters in every land have long looked upon you, Sire, as their leader and model." Such devotion, however, had to be tempered by political realities. When Frederick ascended the throne as "King in Prussia" in 1740, Prussia consisted of scattered territories, including Cleves, Mark, and Ravensberg in the west of the Holy Roman Empire; Brandenburg, Vorpommern, and Hinterpommern in the east of the Empire; and Ducal Prussia outside of the Empire to the east. Frederick's goal was to modernize and unite his vulnerably disconnected lands; toward this end, he fought wars mainly against Austria, whose Habsburg kings reigned as Holy Roman Emperors almost continuously from the fifteenth century until 1806. Frederick established Brandenburg-Prussia as the fifth and smallest European great power by using the resources his father had made available. For one hundred years, the ensuing Austro-Prussian dualism made a unified Germany impossible until Prussia's defeat of Austria in 1866 under the guidance of Otto von Bismarck. Desiring the prosperous Austrian province of Silesia, Frederick declined to endorse the Pragmatic Sanction of 1713, a legal mechanism to ensure the inheritance of the Habsburg domains by Maria Theresa of Austria. He deceitfully invaded Silesia the same year he took power, using as justification an obscure treaty from 1537 between the Hohenzollerns and the Piasts of Brieg. The ensuing First Silesian War (1740-1742), part of the War of the Austrian Succession (1740-1748), resulted in Frederick conquering most of Silesia. Austria attempted to recover Silesia in the Second Silesian War (1744-1745), but Frederick was victorious again and forced Austria to adhere to the previous peace terms. As neighboring countries began conspiring against him, Frederick preemptively invaded Saxony, thus beginning the Seven Years' War (1756-1763). Facing a coalition which included Austria, France, Russia, Saxony, and Sweden, and having only Great Britain and Hanover as his allies, Frederick narrowly kept Prussia in the war despite having his territories frequently invaded. The sudden death of Empress Elizabeth of Russia, an event dubbed the miracle of the House of Brandenburg, led to the collapse of the anti-Prussian coalition. Although Frederick did not gain any territory in the ensuing Treaty of Hubertusburg, his ability to retain Silesia during the Silesian Wars made him and Prussia popular throughout many German-speaking territories. Late in his life Frederick also involved Prussia in the low-scale War of the Bavarian Succession in 1778, in which he stifled Austrian attempts to exchange the Austrian Netherlands for Bavaria. When Emperor Joseph II tried the scheme again in 1784, Frederick created the Fürstenbund, allowing himself to be seen as a defender of German liberties, in contrast to his earlier role of attacking his sovereign, Maria Theresa. When the King of Prussia speaks on problems connected with the art of war, which he has studied intensively and on which he has read every conceivable book, then everything is taut, solid and uncommonly instructive. There are no circumlocutions, he gives factual and historical proof of the assertions he makes, for he is well versed in history ... A genius and a man who talks admirably. But everything he says betrays the knave." According to Voltaire, Frederick's success was also partially due to the personal closeness he enjoyed with his lieutenants: "...when His Majesty was dressed and booted, the Stoic gave some moments to the sect of Epicurus; he had two or three favorites come, either lieutenants of his regiment, or pages, or haidouks, or young cadets. They took coffee. He to whom the handkerchief was thrown stayed another quarter of an hour in privacy." Empress Catherine II of Russia took the Imperial Russian throne in 1762 after the murder of Elisabeth's successor, Peter III of Russia. Catherine was staunchly opposed to Prussia, while Frederick disapproved of Russia, whose troops had been allowed to freely cross the Polish-Lithuanian Commonwealth during the Seven Years' War. Despite the two monarchs' dislike of each other, Frederick and Catherine signed a defensive alliance on April 11, 1764, which guaranteed Prussian control of Silesia in return for Prussian support for Russia against Austria or the Ottoman Empire. Catherine's candidate for the Polish throne, Stanis_aw August Poniatowski, was then elected King of Poland in September of that year. Frederick became concerned, however, after Russia gained significant influence over Poland in the Repnin Sejm of 1767, an act which also threatened Austria and the Ottoman Turks. In the ensuing Russo-Turkish War (1768-1774), Frederick reluctantly supported Catherine with a subsidy of 300,000 rubles, as he did not want Russia to become even stronger through the acquisitions of Ottoman territory. The Prussian king successfully achieved a rapprochement with Emperor Joseph and the Austrian chancellor Wenzel Anton Graf Kaunitz. 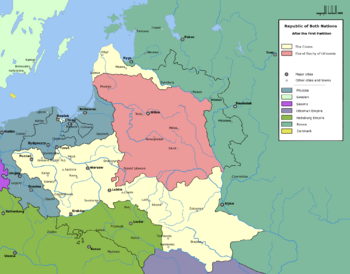 As early as 1731 Frederick had suggested in a letter to Field Marshal Dubislav Gneomar von Natzmer that the country would be well-served by annexing Polish Prussia in order to unite the eastern territories of the Kingdom of Prussia. 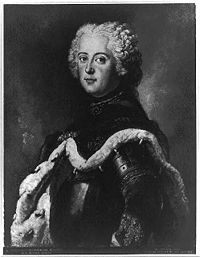 Frederick's brother Prince Henry spent the winter of 1770-1771 as a representative of the Prussian court at St. Petersburg. As Austria had annexed 13 towns in the Spi_ region in 1769, Catherine and her adviser Czernichev suggested to Henry that Prussia claim some Polish land, such as Warmia. After Henry informed him of the proposal, Frederick suggested a partition of the Polish borderlands by Austria, Prussia, and Russia, to which Kaunitz counter-proposed that Prussia take lands from Poland in return for relinquishing Silesia to Austria, but Frederick rejected this plan. After Russia occupied the Danubian Principalities, Henry convinced Frederick and Maria Theresa that the balance of power would be maintained by a tripartite division of the Polish-Lithuanian Commonwealth instead of Russia taking land from the Ottomans. In the First Partition of Poland in 1772, Frederick claimed most of the Polish province of Royal Prussia. Although out of the partitioning powers Prussia annexed the smallest portion of the land (20,000 square miles) and received the fewest new inhabitants (600,000), the new West Prussia united East Prussia with Brandenburg and Hinterpommern and allowed him to control the mouth of the Vistula River. Frederick quickly began improving the infrastructure of the new territory. The Polish administrative and legal code was replaced by the Prussian system, serfdom was alleviated, and education improved. Both Protestant and Roman Catholic teachers taught in West Prussia, and teachers and administrators were encouraged to be able to speak both German and Polish. He also advised his successors to learn Polish, a policy followed by the Hohenzollern dynasty until Frederick III decided not to let William II learn the language. However, Frederick looked upon many of his new citizens with scorn. He had nothing but contempt for the szlachta, the numerous Polish nobility, having told Voltaire in 1771 that the downfall of the Polish state would result from the "stupidity of the Potockis, Krasi_skis, Oginskis and that whole imbecile crowd whose names end in -ki". He considered West Prussia as uncivilized as Colonial Canada  and compared the Poles to the Iroquois. In a letter to Henry, Frederick wrote about the province: "it is a very good and advantageous acquisition, both from a financial and a political point of view. In order to excite less jealousy I tell everyone that on my travels I have seen just sand, pine trees, heath land and Jews. Despite that there is a lot of work to be done; there is no order, and no planning and the towns are in a lamentable condition." Frederick invited German immigrants to redevelop the province, also hoping they would displace the Poles. Many German officials also regarded the Poles with contempt. Frederick did befriend some Poles, such as Count Ignacy Krasicki, a Bishop and later Primate of Poland (1735-1801), whom he asked to consecrate St. Hedwig's Cathedral in 1773. Frederick managed to transform Prussia from a European backwater to an economically strong and politically reformed state. His acquisition of Silesia was orchestrated so as to provide Prussia's fledgling industries with raw materials, and he protected these industries with high tariffs and minimal restrictions on internal trade. Canals were built, including between the Vistula and the Oder, swamps drained for agricultural cultivation, and new crops, such as the potato and the turnip, were introduced. Frederick regarded his reclamation of land in the Oderbruch as a province conquered in peace. With the help of French experts, he reorganized the system of indirect taxes, which provided the state with more revenue than direct taxes. During the reign of Frederick, the effects of the Seven Years War' and the gaining of Silesia greatly changed the economy. The circulation of depreciated money kept prices high. To revalue the Thaler, the Mint Edict of May 1763 was proposed. This stabilized the rates of depreciated coins that would be accepted and provided for the payments of taxes in currency of prewar value. This was replaced, in northern Germany by the Reichsthaler, worth one-fourth of a Conventionsthaler. Prussia used a Thaler containing one-fourteenth of a Cologne mark of silver. Many other rulers soon followed the steps of Frederick in reforming their own currencies—this resulted in a shortage of ready money. We have too many Jews in the towns. They are needed on the Polish border because in these areas Hebrews alone perform trade. As soon as you get away from the frontier, the Jews become a disadvantage, they form cliques, they deal in contraband and get up to all manner of rascally tricks which are detrimental to Christian burghers and merchants. I have never persecuted anyone from this or any other sect [sic]; I think, however, it would be prudent to pay attention, so that their numbers do not increase. Frederick began titling himself "King of Prussia" in 1772; the phrasing "King in Prussia" had been used since the coronation of Frederick I in Königsberg in 1701. Frederick had famous buildings constructed in his chief residence, Berlin, most of which still exist today, such as the Berlin State Opera, the Royal Library (today the Staatsbibliothek zu Berlin), St. Hedwig's Cathedral, the French and German Cathedrals on the Gendarmenmarkt, and Prince Henry's Palace (now the site of Humboldt University of Berlin). However, the king preferred spending his time in his summer residence Potsdam, where he built the palace of Sanssouci, the most important work of Northern German rococo. Sanssouci, which translates from French as "Without Cares," was a refuge for Frederick. When he moved in, he wrote the following poem to his longtime companion, Count von Keyersling: "In this new palace of noble architecture/ the two of us will enjoy complete liberty/ in the intoxication of friendship!/ Personal ambition and enmity/ will be accounted the only sins against nature." Frederick was a gifted musician. He played the cross-flute and composed one hundred sonatas for the flute as well as four symphonies. The "Hohenfriedberger Marsch," a military march, was supposedly written by Frederick to commemorate his victory in the Battle of Hohenfriedberg during the Second Silesian War. His court musicians included C. P. E. Bach, Johann Joachim Quantz, and Franz Benda. A meeting with Johann Sebastian Bach in 1747 in Potsdam led to Bach writing The Musical Offering. Frederick also aspired to be a philosopher-king like the Roman emperor Marcus Aurelius. The king joined the Freemasons in 1738. He stood close to the French Age of Enlightenment and admired above all its greatest thinker, Voltaire, with whom he corresponded frequently. Voltaire referred to Frederick as, "great king, charming tease" and said, "For four years you have been my mistress... Yes I go to the knees of an adored object, / But I leave behind what I love," when he returned to his companion, Madame du Châtelet, in 1740. The personal friendship of Frederick and Voltaire came to an unpleasant end after Voltaire's visit to Berlin and Potsdam in 1750-1753, although they reconciled from afar in later years. Voltaire described their falling out as, "a lovers' quarrel: the harassments of courts pass away, but the nature of a beautiful ruling passion is long-lasting." Frederick invited Joseph-Louis Lagrange to succeed Leonhard Euler at the Berlin Academy. Other writers attracted to the philosopher's kingdom were Francesco Algarotti, Jean-Baptiste de Boyer, Marquis d'Argens, Julien Offray de La Mettrie, and Pierre Louis Maupertuis. Immanuel Kant published religious writings in Berlin that would have been censored anywhere else in Europe. In addition to his native language, German, Frederick spoke French, English, Spanish, Portuguese, and Italian; he also understood Latin, ancient and modern Greek, and Hebrew. Preferring instead French culture, Frederick disliked the German language, literature, and culture, explaining that German authors "pile parenthesis upon parenthesis, and often you find only at the end of an entire page the verb on which depends the meaning of the whole sentence". His criticism led many German writers to attempt to impress Frederick with their writings in the German language and thus prove its worthiness. Many statesmen, including Heinrich Friedrich Karl Reichsfreiherr vom und zum Stein, were also inspired by Frederick's statesmanship. Near the end of his life Frederick grew increasingly solitary. When his longtime companion Fredersdorf sought marriage, Frederick cynically replied, "Have your marriage ceremony today rather than tomorrow if that will contribute to your care and comfort; and if you want to keep a little page and a little scout with you as well, do so." Frederick's circle of friends at Sanssouci gradually died off without replacements, and Frederick became increasingly critical and arbitrary, to the frustration of the civil service and officer corps. The populace of Berlin always cheered the king when he returned to the city from provincial tours or military reviews, but Frederick took no pleasure from his popularity with the common folk, preferring instead the company of his pet greyhounds, whom he referred to as his 'marquises de Pompadour' as a jibe at Madame de Pompadour. Voltaire, Laurent Angliviel de La Beaumelle, the Étienne François, duc de Choiseul, innumerable Frenchmen and Germans, almost all the friends and enemies of Frederick, almost all the princes and great men of Europe, even his servants—even the confidants and friends of his later years, were of opinion that he had loved, as it is pretended, Socrates loved Alcibiades." Zimmermann presented the theory that Frederick started this rumor to draw attention away from an accidental castration which happened during a gonorrhea treatment, but court physicians specifically noted that Frederick was in no way emasculated when they examined his body. Frederick was famously buried next to his beloved greyhounds. Frederick remains a controversial figure in Germany and Central Europe. Unlike many of his contemporaries, Frederick did not believe in the Divine Right of Kings and would often wear old military uniforms unlike the exaggerated French style; he merely believed the crown was "a hat that let the rain in." He called himself the "first servant of the state," but the Austrian empress Maria Theresa called him "the evil man in Sanssouci." His wars against Maria Theresa weakened the Holy Roman Empire, yet gave to Prussia land and prestige that would prove vital for the nineteenth-century unification of Germany. Frederick was both an enlightened ruler and a ruthless despot. Through reform, war, and the First Partition of Poland in 1772, he turned the Kingdom of Prussia into a European great power. Frederick believed that men of rank should be soldiers, thus the equation between Prussian identity and militarism. He saw himself as the people's watchman, with responsibilities towards them but he was no great supporter of democracy, suggesting that republics ended up with despotic governance. Religiously tolerant, although an unbeliever, he ended witchcraft trials and allowed freedom of worship. Some argue that because he did not establish a strong Prussian state Church, this made it easy for Hitler to step into a void with his version of German Christianity. His reform of the civil service laid the foundation of an efficient bureaucracy. Previously, nobles had served as regional functionaries. Frederick allowed Nobles to serve in administrative posts but not in their own ancestral localities. Pay was moderate but bonuses became increasingly available for loyal and efficient service. Frederick used spies to ensure efficiency and honesty and also spied on his spies by regularly touring his departments. It has been suggested that Adolf Hitler was able to use this existing network to enforce conformity and loyalty. ↑ 1.00 1.01 1.02 1.03 1.04 1.05 1.06 1.07 1.08 1.09 1.10 Louis Crompton, Homosexuality and Civilization (Cambridge, MA: Balknap Press of Harvard University Press, 2003, ISBN 067401197X). ↑ 2.0 2.1 Ludwig Reiners, Frederick the Great: A Biography (New York: Putnam, 1960). ↑ 3.0 3.1 3.2 3.3 H. W. Koch, A History of Prussia (New York: Barnes & Noble Books,1993, ISBN 0880291583). ↑ 4.0 4.1 4.2 4.3 4.4 4.5 Giles MacDonogh, Frederick the Great: A Life in Deed and Letters (New York: St. Martin's Griffin, 2001, ISBN 0312272669). ↑ 5.0 5.1 5.2 David Blackbourn, "Conquests from Barbarism": Interpreting Land Reclamation in 18th Century Prussia. Harvard University. Retrieved May 24, 2006. ↑ 6.0 6.1 Gerhard Ritter, Frederick the Great: A Historical Profile (Berkeley, CA: University of California Press, 1974, ISBN 0520027752). ↑ Norbert Finszch and Dietmar Schirmer, Identity and Intolerance: Nationalism, Racism, and Xenophobia in Germany and the United States (Cambridge: Cambridge University Press, 2006, ISBN 0521525993). ↑ W. O. Henderson, Studies in the economic policy of Frederick the Great (London: Cass, 1963). Johansson, Warren, and William A. Percy. Outing: Shattering the Conspiracy of Silence. Harrington Park Press, 1994, p. 63. History of "Frederick II of Prussia"
This page was last modified on 10 May 2017, at 16:10.